Baalbek was a Phoenician city before the arrival of the Romans, known as Heliopolis, the city of the sun, as the Phoenicians worshipped the sun god Baal here. The Romans arrived in 64 BC and began construction of huge temples to their gods Bacchus, Jupiter and Venus in addition to the Great Court of Baalbek, constructed in the 2nd century AD. Jerash is one of the finest examples of a Roman provincial city anywhere in the world and a highlight of any trip to Jordan. It is the best preserved of the Decapolis, a confederation of ten self-governing cities that developed in the area following the Roman conquest in the 1st century BC. A triple arch gateway leads to the Colonnaded main street, where grooves in the paving stones are reminders of the chariots that once rode along these streets. Other impressive remains include two theatres, the forum, the temple of Zeus, a nymphaeum and a hippodrome. Along with Jerash, the classical sites of Umm Qais and Pella marked two other cities of the Roman Decapolis. The remains of ancient Gadara at Umm Qais are located on a plateau overlooking the Sea of Galilee, which was once a major cultural and artistic centre and an important stop on several trade routes. Most of the remains at Pella date from the Byzantine period. 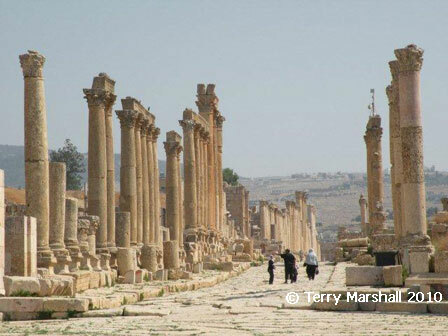 Located as an oasis in the Syrian desert northeast of Damascus, Palmyra was one of the great cities of the ancient world and is one of Syria's main attractions. 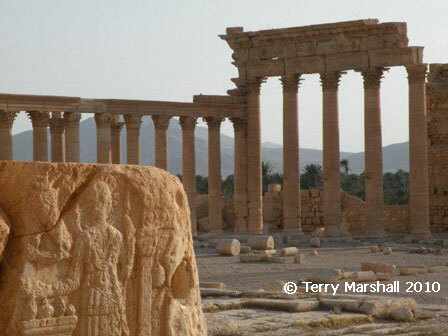 Although settled for millennia, Palmyra reached its cultural and architectural peak from the 1st to the 3rd centuries AD as a key trading centre along the Silk Road when taxes and levies paid for its wonderful buildings. Palmyra developed as a powerful city state of the Roman Empire under Queen Zenobia until she declared independence from Rome which led to Roman legions razing the city in AD 217. Zenobia was carried off to Rome in golden chains. The Grand Colonnade is the city's main axis, running for 1,100 metres from the Temple of Bel to the Camp of Diocletian. The white limestone Bel Temple is the city's best preserved monument, dating to the 1st century. Other features include the Theatre, Agora (or marketplace) and the Valley of the Tombs. 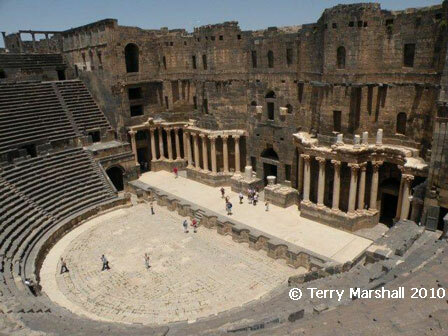 Bosra became the capital of the Roman province of Arabia in the 2nd century AD and prospered for centuries as a key stop on the trade routes linking Damascus with Amman and Aqaba. Rule and occupation by various empires has left its mark on the city. Its most famous feature is its Roman theatre, perhaps the best preserved and largest of its kind anywhere, holding some 15,000 people. It is enclosed within a citadel, fortified by the Arabs in the 13th century to counter the threat of the Crusaders. Other notable attractions include the 6th century Cathedral of Bosra and the Mosque of Omar.